← Barbados Free Press wishes you a safe and prosperous 2010! Professional politician, former Acting Prime Minister, Senior Cabinet Minister and Attorney General Sir David Simmons announced his resignation from the position of Chief Justice, effective April 29, 2010 – the day after his 70th birthday. Sir David refused to answer a reporters question about whether or not he asked to retain the position for another two years. In any event, Simmons will be going and with him the most visible evidence of the successful Barbados Labour Party campaign to exert political control and influence in our Supreme Court and throughout the justice system. Sir David’s appointment as Chief Justice was an overtly political act – a perverted act that was all about consolidating power for the BLP cabal under then PM Owen Arthur. When the lifelong politician who was Attorney General under two governments and acting Prime Minister on many occasions became Chief Justice virtually overnight, it all but eliminated the separation of powers between the government and the judicial system. But then again, that was the plan. With over 25 continuous years as a professional politician and only the last 7 years as a judge, David Simmons as the Chief Justice was, and still is, a political event. The courts in Barbados have always been a highly politicized but this reality moved to new heights during the BLP government when then-Prime Minister Owen Arthur appointed his long time political colleague and Attorney General as the Chief Justice of Barbados. The move effectively consolidated the power of the government and the courts under the control of Barbados political elites – and the image of both the courts and the Office of the Chief Justice have never recovered. When David Anthony Cathcart Simmons agreed to accept the position from his old friend Owen Arthur, he brought the administration of justice in Barbados into disrepute. It is the very presence of a career politician, former Attorney General and former Acting Prime Minister as Chief Justice that warns ordinary people that they haven’t a hope of seeing justice in Barbados. Simmons didn’t care about the politicization of the court though: he reveled in it. He continued to attend political functions – even lending the credibility of the office of the Chief Justice to the Communist Chinese government that published articles bragging about Simmons’ attendance at embassy functions. We bet that SIR David Simmons never even considered whether or not it was ethical for the Chief Justice of Barbados to make a political statement of support for such a brutal government – but the Chinese news media were all over it telling their people that the highest judge in Barbados is a friend. Chief Justice Simmons even bragged in the newspapers that he was continuing the revamp of the Barbados courts that he started as Attorney General. The pathetic man just doesn’t get it! He can’t see, or doesn’t care, how unethical it was for him to accept the position of Chief Justice. He singlehandedly did more damage to the public perception of the Barbados judicial system than any other individual since our independence. As Chief Justice, Simmons continued making political speeches and consolidating power for the BLP. Unbelievably he called for the Police and Military to be united as one force answering to government. Like we said, he just doesn’t get what separation of powers or democracy is all about. One thing is certain: if the Thompson Government has any integrity at all, our new Barbados Chief Justice will be a totally apolitical person whose very presence does not taint the entire justice system with the stink of partisan politics… as did SIR David Simmons for the last seven years. October 3, 2008 Would Bussa Have Accompanied Barbados Chief Justice and Prime Minister To Chinese Embassy Celebration? Here is the Nation News article in full in case it somehow disappears as frequently happens when the Barbados news media decides at some later date that it wants to change history. We encourage readers to follow the link to read the article at The Nation News. CHIEF JUSTICE SIR DAVID SIMMONS is calling it a day after seven years on the bench. Sir David, who goes on pre-retirement leave in just over two weeks (January 20) informed Governor General Sir Clifford Husbands last week of his retirement which officially takes effect April 29, National Heroes Day, a day after he celebrates his 70th birthday. “A new year is the ideal time for somebody new to come. I am getting old,” Sir David told the SUNDAY SUN in an exclusive interview yesterday. The outgoing Chief Justice noted that in the final two days of last year he took time out to inform all his charges, including fellow judges and magistrates, about his retirement. “After spending 32-and-a-half years in public life, I am just getting tired,” Sir David added, noting that his retirement was a welcomed family relief. Sir David declined comment on the question of whether or not he had applied for a two-year extension, which under the Constitution permits the Chief Justice or a court of appeal judge to proceed to age 72. He however described his period in the judiciary as enjoyable. “I’ve enjoyed it tremendously and I have been very happy doing the job on behalf of the people of Barbados,” he said. Sir David, who served as Chief Justice from January 2002 and has the enviable record of never having been overruled by another court, said that during his tenure, he was able to “get a lot done”, including building of the new Supreme Court and upgrading a number of systems within the judiciary. About his future, the Chief Justice said he would consider doing a number of things, including consultancy. “Whatever comes along I would do within reason. I will be available to do things like arbitrations, special inquiries and probably mediations,” he said. Sir David, who is married to former high court judge Madame Justice Marie MacCormack, served as Member of Parliament for 25 years and was Barbados’ attorney general from 1985 to 1986 and 1994 to 2001. Meanwhile, legal sources have indicated that Court of Appeal judge Justice Sandra Mason is tipped to succeed Sir David. Should that appointment be confirmed, she would become the first woman to head the judicial arm in Barbados. It has also been reported among the legal fraternity that Professor Andrew Burgess, former Dean of the Faculty of Law at the University of the West Indies, is tipped to fill one of the Court of Appeal vacancies when Appeal Court judge Justice Waterman retires in May. What a prosperous 2010 lies ahead for me…Al Barack. I always questioned why the Chief Justice was not keen on using his awesome power to get government to respect the decision of the Court. But alas…..David Simmons indicates his intention to resign…..and already I am receiving calls to get my bank account in order to receive my loot. Good riddance to the CJ. Now we move to the next question: Who will be our next CJ? Any suggestions? No one would question the contribution made by Sir David Simmons. He is part and parcel of an elite group of men and women that have made Barbados what it is today. Any idiot with an ounce of sense knows that the man helped build this nation. But everyone with a pound of common sense knows fully well that his appointment to the position of chief justice was unethical and politically motivated. He tarnish himself when he took the office of chief justice being a seasoned politician and one who have had his share of controversies amidst the Barbados Labour Party. What did he expect, that right thinking citizens would feel comfortable with this; particularly when people feel that his judgement could be influenced as a result of his loyalties and pledges to party and friends. Bajans are not as reticent and foolish as before. Bajans are not as gaged and afraid as before. The politicians know fully well that there are many opposers to their crap and once upon a time when things could be kept secret and well hidden, it is not that easy anymore. We are thankful for Sir David Simmons contribution but I am more thankful that he has resigned his position. Now we await the next CJ with baited breath. It would be good to see if anyone has any evidence that David Simmons’ tenure as Chief Justice actually led to a clear politicisation of the justice system as evidenced by subsequent Court rulings and decisions. But I agree with an argument that the PERCEPTION that this could occur with a career politician taking over the mantle of Chief Justice should have been the foremost consideration, and should have informed that particular decision of his becoming Chief Justice. And when this message of the importance of perception is lost at the top, should those in authority be surprised by some of the negative behaviours in our society when there may be the the perception in that society that moral and ethical gaps exist at the leadership level? The story of Kim Joseph at the top of your blog and all the other stories of injustice highlighted by BFP over the years, to a great extent, spotlights the need for a Chief Justice to lead and be pro active in all things outrageous and unjust in our society. permitting lawyers to drag on cases for years without resolution and failure to insist on basic concepts accepted as the Rule of Law, indicate a Chief Justice who has not done his job. In addition to choosing a new independent Chief Justice who has integrity and a sense of social justice, the government really needs to appoint an independent group of citizens to overview the legal profession and the police. These professionals should not be judging there own wrongdoing and have never truly had an active watchdog looking over their shoulders and reporting their findings to the public. There are Lawyers who contribute on this blog. I would like them to be kind enough to explain why it takes years to settle Estates and other civil matters. I am at a loss to understand the process for getting good title to a property. I have heard mind boggling explanations and excuses. Also heard of Lawyers who fly half way around the world to serve rich and famous clients and that is understandable. The Rich can afford to pay for exceptional service. The average Bajan deserves reasonable service from Lawyers.Making ordinary people wait more than a year to settle an estate is unconscionable. I agree wholeheartedly with sad very sad and Micah. It would be difficult to agree with you, BFP, that Simmons did this “damage” are you are always ranting about. I believe the man was fair while performing his job as Chief Justice; sometimes even ruling against his party. However, it becomes blurry and suspect when a politician with the experience and power-connections becomes Chief Justice when his party is in power. Even though it would have been enticing to Sir David, I firmly am of the opinion that he should not have taken that position, because it reeked of political payment for loyalty services rendered. Even if that were not the case, it surely smelled that way. In addition, it would have set an unethical precedent for such an important position. I wish, however, to thank him for his services to the country. If there has ever been a successful politician, like him or not – he has been the epitome of sucess! Sir David is no idion… not by any stretch of the imagination. He accepted the post of CJ in spite of the fact that he was a MP of the Lower House at the time. Why are his supporters trying to paint an aslternative picture. You play by the sword and you die by the sword… where have I heard these words before? Unfortunately the DLP has been given a blank sheet to follow in the BLP’s footsteps. At this rate do not be surprised if Mr. Maurice King or Mr. F. Stuart are candidates for the position of CJ. Estwick you are a fool to think that the lack of evidence of corruption against Simmons is evidence that nothing is wrong. It means that “da boyz” look after each other. Simmons has been one of “da blp & law boyz” for 40 years. He was a politician for 25 years and Attorney General of the same government that appointed him top judge in the land. If you don’t think something is wrong with that I can’t give you a brain to think with. Before you go on pre retirement leave on 20th January, 2010 can you see to it that the Thompson Administration honour the Court decision and pay me the $ 65 million judgement…..and do not attempt to cut it down to $ 45 million ? Remember your one time Cabinet colleague , George Payne , is to get some of this money ! A dems will be the next C.J. you are absolutely correct except there are dozens and dozens of supposedly rich foreign investors who have had to wait years for title to their property not to mention the ones that have been personally threatened if they challenge the system. NO ONE, especially a little guy should have to endure this legal abuse. I will say this once and once only. Most of you including the editors have not a CLUE what scholarship and dedication it takes to be a judge, including in this island. As a citizen I respect these men and women for what they give. Well done Sir David. Some of us do ‘know’, even if the ignoramuses do not. Please, and if you forgive me one word m’lud, forgive the jackasses, they simply do not understand the level at which you people work. Best of luck for your retirement. You know what? Sir David is 70 years old. And you know what else? According to the books, it is time for him to retire. I say let him go. On the one hand, we are asking for those in government a really really really long time to retire as they are clogging up the works with their archaic thinking and practices and not allowing “young” fertile minds to progress. On the other hand, we want to keep them forever and a day because of their institutional knowledge. Make up your mind. You cannot take the first stance with the caveat “but let us choose who will stay on”. Asking for an extension in services is logical if you have NO ONE ELSE to fill the position. But we have more than enough qualified, certified, experience-ridden legal gurus who can ably continue where Sir David left off. Further more, many of them run in the same circles so perhaps it may be as though he never left. I have just being notified that I will be taking over as Chief Justice from Sir David Simmons. I am indeed humbled by this appointment and look forward to upholding the best traditions of the Rule of Law in this country. Well if this is true Mr. Cheltenham and not a hoax, congratulations are in order? Any general ideas and plans to clean up the legal abuses and delays in Barbados in order to make a more efficient, responsive and accountable legal system for each and every Barbadian? Ya see me? ef I had my way I would dun de dance an appoint Madame Justice Elnish Kentish as de first female chief Justice.I would while I at it mek Magistrate Pamela Beckles a Judge den I would tek Pilly de Kid an meck he registrar ah de Supreme court.I ain’t dun yet! 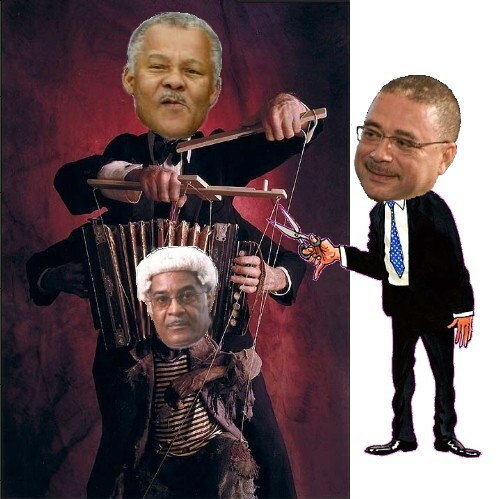 I would mek Al Barrack the attorney General….then teck way muh self!!! !After six months, I would recall Sir David Simmons from outta he bed.70 or not.